Because, seriously, Friday is still 2 days away. I love you, Wednesdays is my bloggin' attempt at a.) shutting up about my products and sharing the love of others' with others! and b.) sharing sources of inspiration that often stands behind my jewelry and creative process. Summer's a beach, right? I mean that in the nicest way possible :) If I were to ask the question, "What symbol comes to mind when you think of summer" on Family Fued, I am will to put money on something beach related being one of the top answers (ding ding ding!). And I wish I could say that I would prefer basking in that top answer in my spare time on the weekends and be perfectly happy. "But Christyn," you implore, "You live in Los Angeles? Isn't love of the beach a requirement for residency?" Good, insightful question, my blogging friend. I, in fact, don't really care for the beach. Well, let me rephrase that, I enjoy spending a few hours on the beach when it's a perfect 78 degree sunny day and there is no traffic. And no trash on the beach. And no loud, drunken people getting in the way of my view. And no public toliets to endure. And no sunburn (I am a born-red head - there is ALWAYS a sunburn involved). And the long drive through Los Angeles traffic just to get 10 miles to the nearest beach (which, to me, is Malibu). And the feeling of utter exhaustion when I get home. I would much rather spend my time at home in the air conditioning making jewelry that reminds me of the beach than spending time on the subject of the jewelry itself. Call me crazy. In fact, I really do enjoy beach-related art/items/jewelry - much better than the beach itself (cause, let's face it, a cute necklace won't bite me nor requires that I use a sandy, dirty public toilet!). Lately I have been really fascinated with the contrast of delicate gold and the cream white of shells or pearls, like the gold sand dollar necklace on the right (which is being used in wedding as bridesmaids necklaces for the second time this summer!). I am also digging red coral and turquoise color combination, as seen in this "Under 'da Sea" pearl and coral necklace (above). These fun little necklaces make enjoying the beach so much cleaner and less time consuming -- plus I don't have to embrace LA weekend traffic in order to enjoy them! I actually have sand dollar and sea horse charms at home that I have yet to play with, and LOTS of shells in which I need the husband to drill holes into so I can use them as charms! Etsy is full of good Beachin' products - especially products in the color scheme I am digging - reds, teals, and creams! These colors alone, let alone when they represent all that is "simple" and artistic about the beach, totally inspire me to stay indoors and create! Go figure! I think it's safe to say that I have a bit of a crush on Pillowhappy - cause, come on, what great accent pieces! If only drooling over these items could get me a tan... So, what inspires you today? I love time on Northern California beaches.....sooo different than down south. I also vividly remember my time on East Coast beaches when we visited family. Again, soooo different! Either way, when we find one that isn't crowded and has plenty to investigate, we soak in the sounds of the crashing waves, the ocean critters at shore, and blissful peace. What inspires me is the Oregon coastline! I love trees. The pines come right down to the beach! Of course, this causes driftwood, or should I say, "driftlogs"! We have miles of pristine coastline! A true inspiration! The Central Coast of California is home to me and the beach is my favorite place here. The Oregon coastline is so different and gorgeous! Much more dramatic and full of trees and driftwood. 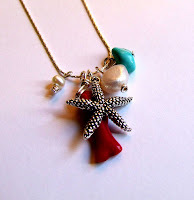 Your nautical collection is so fun, love the star fish. I really love these necklaces you made! What inspires me: Rene Magritte. I adore these necklaces you made! What inspires me: Rene Magritte, a surrealist painter. We're Back - and with a Giveaway!